Dru Prosser is a trial lawyer whose state and federal litigation practice encompasses the areas of complex business litigation, products liability, professional negligence, healthcare, and insurance defense. Dru has dedicated his practice to cultivating a comprehensive understanding of the civil litigation process through hands-on, strategic management of a broad variety of civil lawsuits. Dru earned his bachelor’s degree in biochemistry from Abilene Christian University in Abilene, Texas, and graduated with highest honors from the University of Tulsa College of Law. While in law school, he served as an articles research editor of the Tulsa Law Review, was a member of Phi Delta Phi legal honor society, was named to the Order of the Curule Chair, and received CALI awards for academic excellence in six classes, including Torts, Civil Procedure II, Health Law, and Trial Practice. 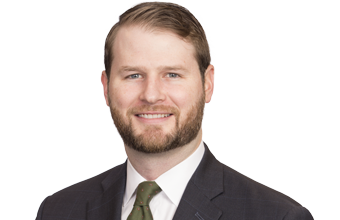 Prior to Joining McAfee and Taft in 2018, Dru was an associate with a Tulsa-based litigation firm. Obtained a jury verdict in Tulsa County, Oklahoma, in favor of an obstetrician on claims of professional negligence. Obtained a six-figure jury verdict in Tulsa County, Oklahoma, on claims for breach of contract and violation of Oklahoma’s Uniform Fraudulent Transfer Act arising out of the sale of a medical practice. Obtained favorable settlement for rural landowner in suit against neighboring chemical company arising out of contamination of soil and surface water. Deposed parties, fact witnesses and experts in a variety of personal injury and professional negligence cases. Briefed and argued a broad array of discovery disputes in state and federal court.